This fight scene is easily one of the best of the series and see’s Faith’s apartment being pretty much trashed in the ensuing brawl which is anything but a clean fight, while Faith really ensures that even in defeat she goes out on top. That being said I couldn’t help but wonder that even at this point in the Buffyverse that the writers had plans for her character beyond this finale, which might explain why they choose to put her in a coma rather than kill her off. Sadly the second half of this finale never quite hits the heights of the first with the group spending a lot of time preparing for the showdown and dealing with yet another fist shaking moment from the Mayor. To his credit does come close to killing an unconscious Buffy when he attempts to chillingly smother her to death in a fit of rage after he finds out what happened to Faith following the pair’s confrontation only to foiled at the last minute by Angel. Perhaps because we have the two big showdowns between Buffy and Faith aswell as the final showdown with the mayor, they felt the need to split the action between the two episodes, though I couldn’t help watching this back that it would have benefited from an extended episode. Certainly this would have saved us having to deal with a lot of the plodding plot points between these episode highlights as the group gear up for potentially their final battle. On the flip side though it’s during these down moments that we do get some equally important minor moments such as Cordelia and Wesley finally kissing in the library only to find out they actually have zero chemistry in an amusing twist from all the will they won’t they teasing we’ve had since his arrival. One relationship which continues to grow here though is the one between Xander and Anya with the two continuing to grow closer, especially with Anya planning to skip town before their Graduation knowing all too well from having been present at a previous assentation just what it spells for Sunnydale. It was also great to see Anya being brought into the group naturally as it kept the flow of the episode without feeling that her inclusion was for the convenience of the writers trying to tie it all together. 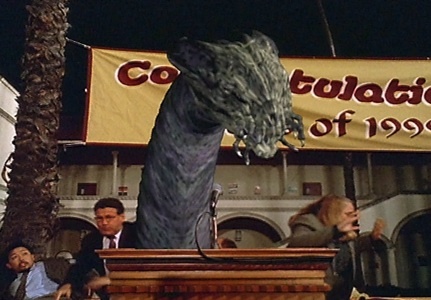 Obviously the Mayor’s Ascension is the big finale for the season as he turns into a giant 60-foot snake demon while addressing the students of Sunnydale high during their graduation ceremony only to suddenly find the students of Sunnydale High are armed with flamethrowers, crossbows and various other weapons in another of my favourite Buffy moments, which even after multiple rewatches is still such a fantastic moment, even if it makes zero sense how Buffy managed to convince the whole of the student body to form an army to fight the mayor. The only explanation I can think of being that they trust in her to protect them especially following her “Class Protector” award in the previous episode “The Prom”. While perhaps a giant snake demon might not have been what we were expecting after a season of the mayors Ascension being teased out, but it’s a form which makes for a fittingly climatic battle while the writers are more than happy to kill off a few of the minor characters such as Larry who gets swatted though whose death wouldn’t get confirmed outside of the shooting script till Season Six episode “Smashed”. 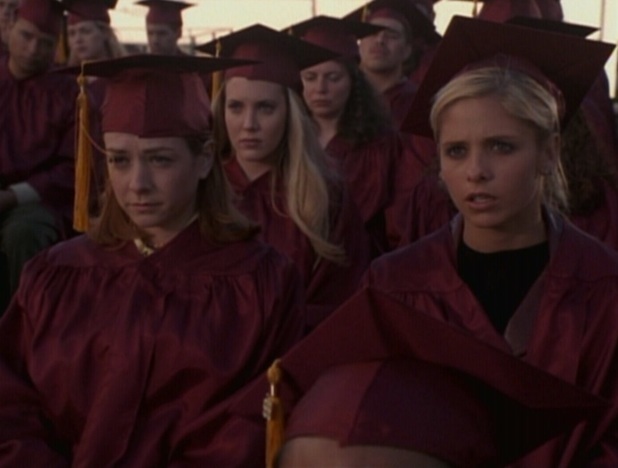 Seeing how this is also out last season at Sunnydale high its equally fitting that the school get destroyed, closing the chapter on this era for Buffy and the Scoobies especially with so many of the members at this point facing a life away from Sunnydale. Angel’s departure into the night post battle is still quite a ballsy move as he lives up to his promise and just leaves, giving Buffy no more than a longing glance and avoiding the cliché final reunion between the pair and its really only the stronger a moment for this. A fitting end to the season though perhaps one whose lead up could have been improved over the course of the series, which has been one better remembered for its monster of the week episodes than its big Evil. Still with the school destroyed, Angel having left Sunnydale for LA and the start of his own spin off and many of the groups futures left scattered it’s really an ending which leaves things wide open as to where the series goes next.